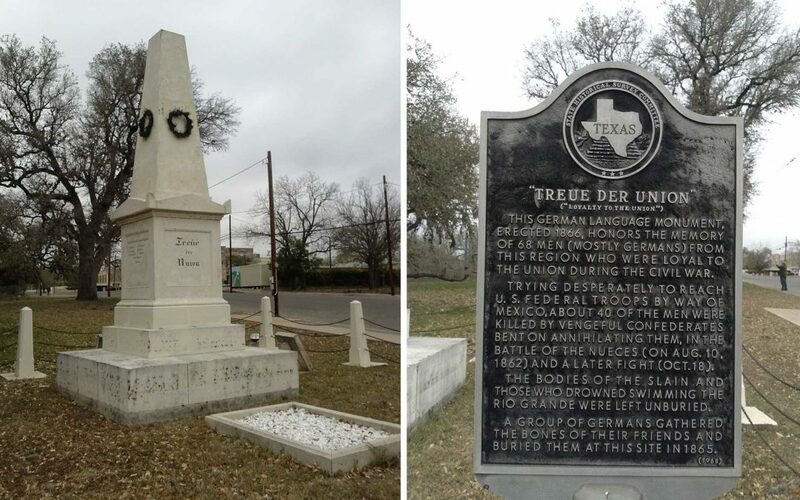 The German-language Treue der Union Monument (loyalty to the Union) was dedicated on August 10, 1866 to commemorate those who died at the 1862 Nueces massacre. In 1862, the Confederate States of America imposed martial law on Central Texas, due to resistance to the Civil War. Jacob Kuechler served as a guide for sixty-one conscientious objectors attempting to flee to Mexico. Scottish born Confederate irregular James Duff and his Duff’s Partisan Rangers, from San Antonio, pursued and overtook them at the Nueces River. Thirty-four were killed, some executed after being taken prisoner. The cruelty shocked the people of Gillespie County and surrounding areas. Two thousand took to the hills to escape Duff’s reign of terror. The Freethinkers had immigrated to Texas after a failed democratic revolution in Germany in 1848. They disliked organized religion, believed in civil liberties and opposed slavery.